I did my first dive in the South France in 1973 while on a School PGL trip but didn’t take up diving properly until 1979, been diving ever since. I’ve attained BSAC/SAA Dive Supervisor / Instructor within Dive Club environments and held various club committee position including Diving Officer. Currently, hold RYA Yatchmaster Dot tickets for Sail and Power Dived round most of the UK, but most experience in the Sussex area. Although I have experience of diving other locations like Saudi Arabia (ARAMCO 3 years) and a trip with the Canadian Navy to dive Glacier Bay on HMCS Yukon which is now its self a dive site in San Diego since July 2000. 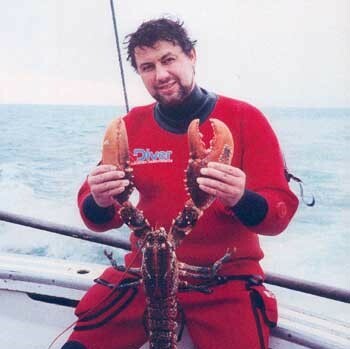 Contributor to ‘Dive Sussex’ Dive Guide. Took part in the MARE expeditions 87/88 to the Lipari Islands (Dattilo) to recover artefacts from a 5th century BC shipwreck. Took part in the Clipper 96 Round the World Yacht Race Hong Kong to Plymouth section 16250 sea miles and the 1999 ROC Fastnet series of races. The vessel features the large, full beam superstructure option, especially modified to provide a large, spacious aft work deck with a covered ‘shelter area’. 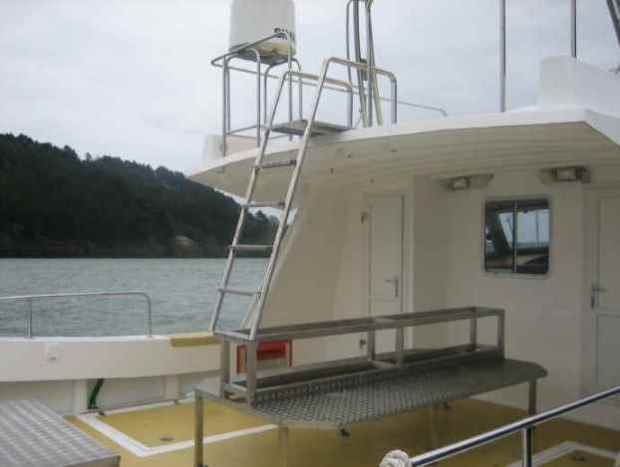 Transom mounted aluminium divers lift on the st/bd hull, and a back up dive ladder on the port hull, both accessed through wide, substantial transom doors. Diver recovery is further aided by the use of bow and stern thrusters capable of being operated from the transom, as well as the flybridge, which itself is a major safety feature in providing a high vantage point for diver location and recovery. Stainless steel seating modules are fitted in the aft cockpit and in addition provide storage for the diver’s air bottles and equipment. 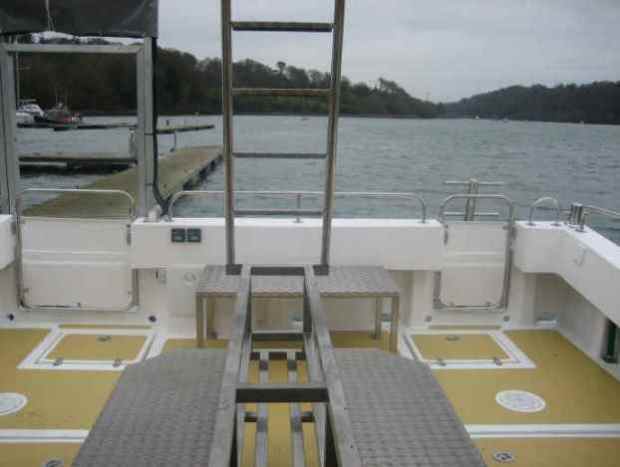 The stern seating area has been extended the port gunnel, using a quick release system to provide access to the back up dive ladder on the port hull. 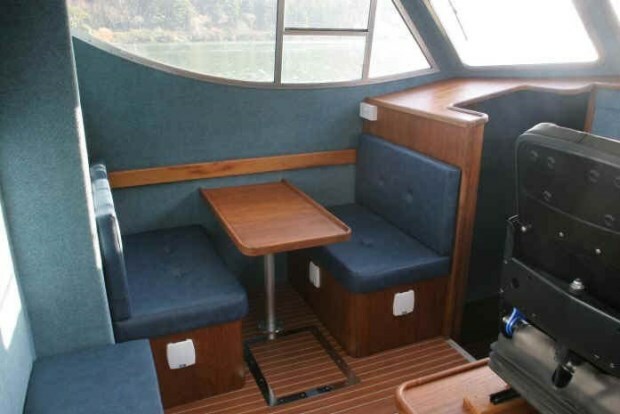 Fit out and equipment levels were to an exceptionally high standard for a commercial vessel featuring very luxurious accommodation, the cabins sole is finished in teak, with a Corian interior fit out throughout. 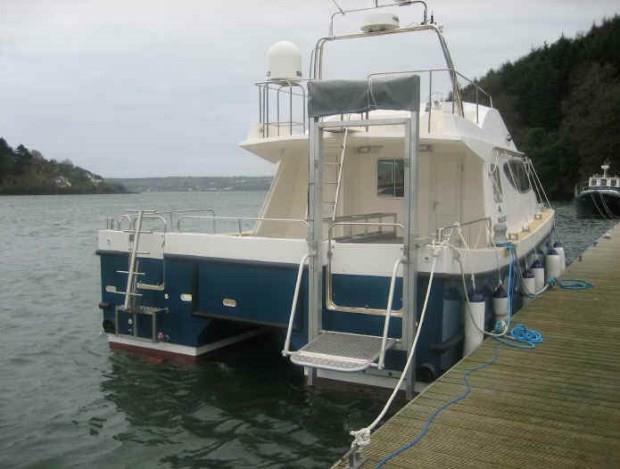 Twin bunk berths in the port hulls cabin, and a large main berth over the bridge deck and in the st/bd hull, provide comfortable and private sleeping areas. The catamarans wide beam allows for a spacious main cabin with a full galley, dinette and passenger seating. 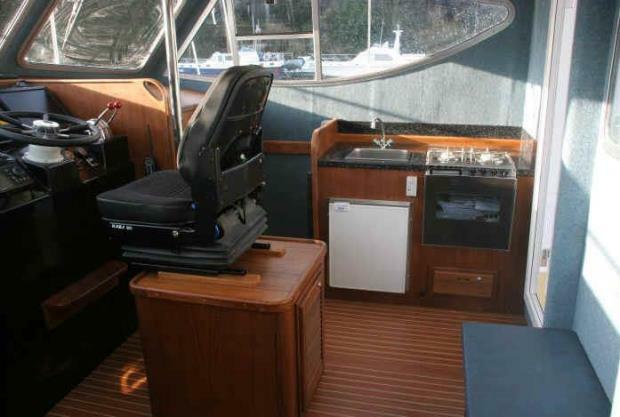 Entertainment is provided by a Satellite receiver allowing TV reception offshore, viewable on an LCD screen fitted in the wheelhouse. 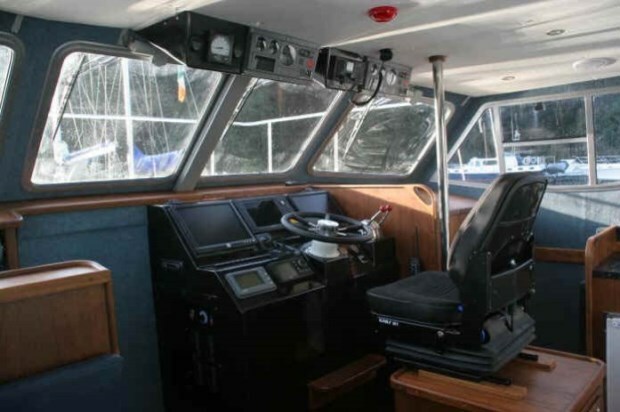 A very high spec electronic fit out with triple navigation screens featuring Simrads high end navigation hardware, and a custom made overhead console for the engine instruments make her one of our most sophisticated craft to date. 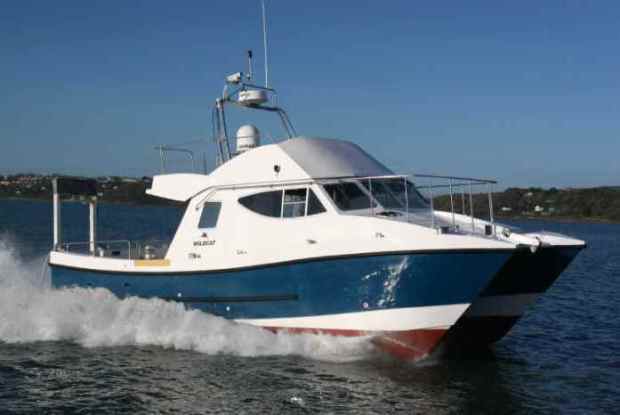 Powered by two Yanmar 370hp engines and with a 9,500kg displacement she has a top speed of 28kts, and provides very relaxed cruising in the mid 20’s. Sussexshipwrecks are continuously looking at ways to improve navigational equipment to provide repeatability of wreck location for shot positioning and drift fishing. 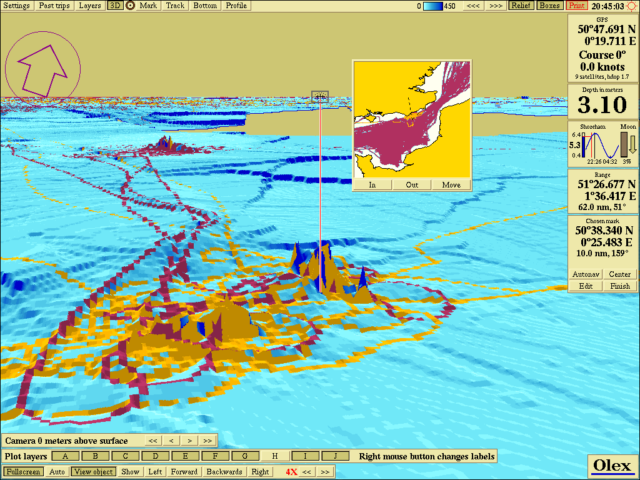 When Sussex was built the electronics package included a high end Simrad navigation system, Scientific Transducer and Olex Seabed Mapping Software. In 2016 the highest mapping resolution we could achieve was 5m x 5m as GPS had at best an accuracy of 3m. 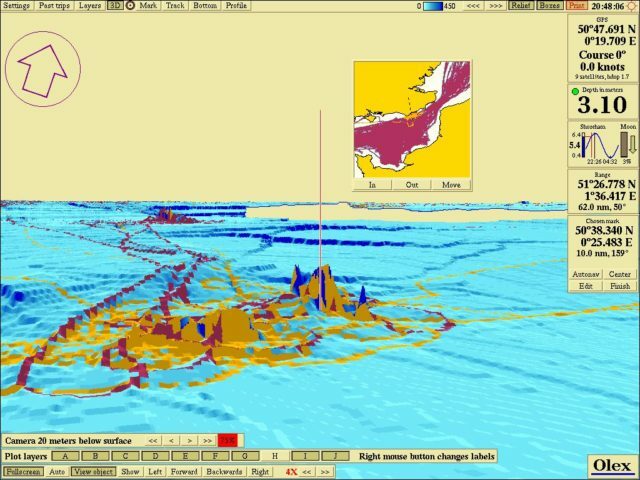 Sussex has recently undergone a navigational upgrade and can now achieve a resolution of 1m x1m with the addition of a GPS Compass which provides 1m accuracy 95% of the time. The plot is viewed from surface level, looking North up the slope out of the shipping lane, in the foreground SS Emerald with the Caleb Sprague to the right. The SS Glenartney is the wreck above the Emerald on the top of the slope.